With film rights already snapped up, this won’t be the last you’ll hear of Matt Haig’s latest flight of imaginative wonder. A generous, sensitive story of a life lived outside of time’s boundaries. I am old. That is the first thing to tell you. The thing you are least likely to believe. If you saw me you would probably think I was about forty, but you would be very wrong. Tom Hazard has a dangerous secret. He may look like an ordinary 41-year-old, but owing to a rare condition, he's been alive for centuries. From Elizabethan England to Jazz-Age Paris, from New York to the South Seas, Tom has seen a lot, and now craves an ordinary life. It’s a life he once had, long-since buried but buried secrets have a habit of catching up with you and nobody can outrun their own past. A British author who blurs the lines between genres, blending fantasy, myth and science fiction to create some of the most inventive and enduringly popular contemporary fiction, Matt Haig is a favourite with Waterstones booksellers. His novels include The Radleys and The Humans as well as children’s books including A Boy Called Christmas and The Girl Who Saved Christmas. He is also the author of the Sunday Times bestseller and Waterstones non-fiction Book of the Month, Reasons to Stay Alive. 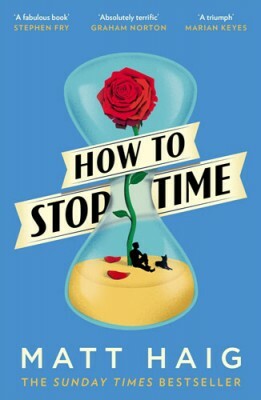 Read a Waterstones exclusive interview with Matt Haig where he discusses How to Stop Time, as well as his bestselling memoir Reasons to Stay Alive and the pull of getting lost in time. An author who blurs the lines between genres, blending fantasy, myth and science fiction to create some of the most inventive and enduringly popular contemporary fiction, Matt Haig is also amongst Waterstones bookseller’s favourite authors. His novels include How to Stop Time, The Radleys and The Humans as well as children’s books including A Boy Called Christmas and The Girl Who Saved Christmas. He is also the author of the Sunday Times bestseller and Waterstones non-fiction Book of the Month, Reasons to Stay Alive and the follow up, Notes on a Nervous Planet.